Please excuse this brief but rambling entry – I’ve just jotted down some notes to catch up! 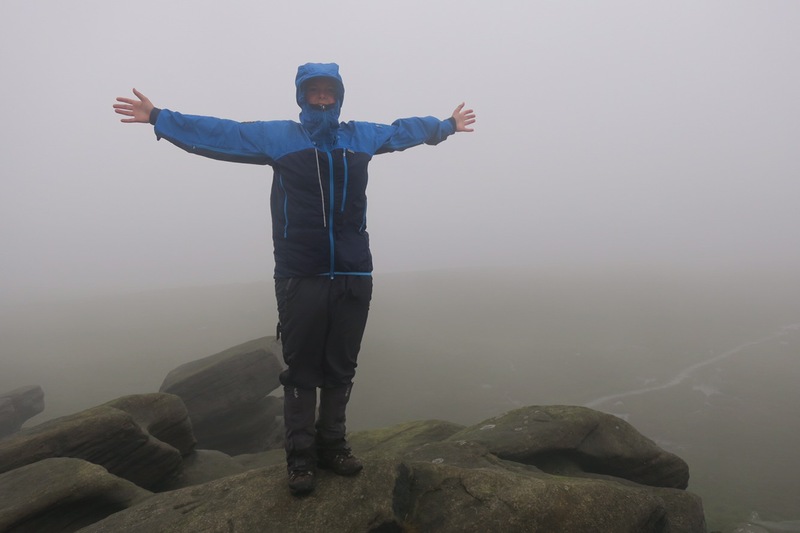 Having had the best night’s sleep of the trip it was hard to drag myself out from under the fluffy down duvet and out into the rain again – hence the slightly late start! Today was proper moorland walking with plenty of grouse (and shooting of said grouse). I was worried when I flushed them out that they would get shot straight back down again! Luckily that didn’t happen. Headed up over Black Tor and Lost Lad for the stunning panoramic views. Got some relief from the rain alongside the reservoirs – which were noticeably low, so I suppose we need the rain. Rose above the reservoirs and experienced the first of the peat groughs – a sign of things to come me thinks. Reached the Dog & Partridge almost dry but still appreciated the open fire in the bar. Another hot bath awaited me which was lovely. Got talking to the landlord over dinner and he kindly bought me a beer. Left via South Nab and as I started to descend and leave the main road behind me, a man pulled up in his Land Rover. He got out and started heading down the slope in my direction, shouting loudly and rapidly “HEY, HEY, HEY…”. I was slightly disconcerted but I knew I was on access land so the fact that I wasn’t on the right of way shouldn’t have been a problem and I don’t think he was trying to warn me. I glanced over a couple of times but his call didn’t change. I decided to keep my head down and just keep going to see what happened. The penny finally dropped when I realised he was rounding up his sheep and it had nothing to do with me. Phew! After a rest in the pub at Holme it started raining again and a ‘shortcut’ I opted to take actually turned out to be harder work and drenched my feet – you win some, you lose some! 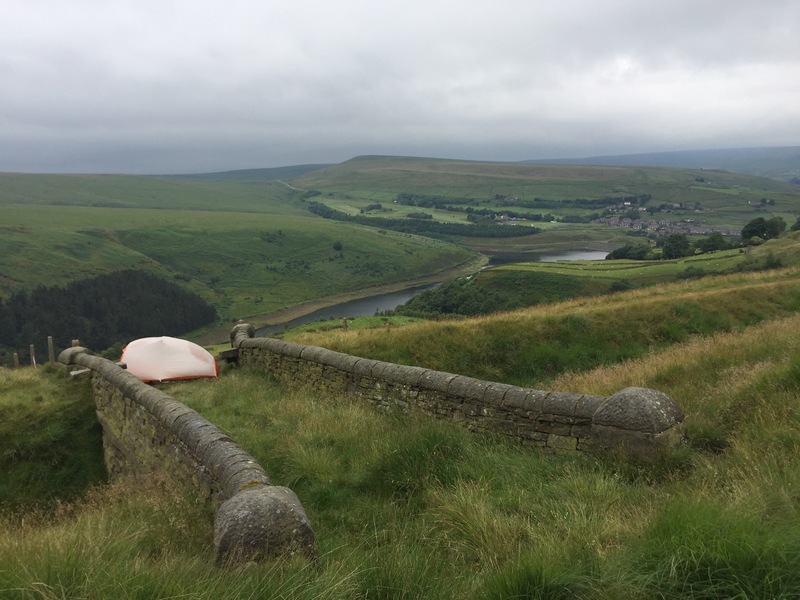 I got to Wessenden Head and the prospect of another 6 miles or so was not appetising (including a 2 mile diversion to a campsite that would have to be retraced in the morning). I had enough provisions for a wild camp so that’s just what I did. I stopped above Butterley Reservoir on a disused bridge and I basked in the 5 mins of evening sun that poked through the cloud. Packed up an almost dry tent after a windy night but slept better than usual. Walked straight down into Marsden for a breakfast of avocado and poached egg on toast – scrummy! Passed by more reservoirs (they scatter the landscape around here – something I’ve never noticed before having not spent any significant time up t’north). When the sun came out I just stopped where I was, spread my wet things out and basked on a rock for 30mins. It felt so good! Manshead Hill loomed over but it wasn’t a painful climb – listening to Hakuna Matata and singing along at the top of my voice I actually bounced up the hill. The views from the top were extensive and stunning. I think I could see Leeds and the Ferrybridge Power Station which is 30 miles away as the crow flies. 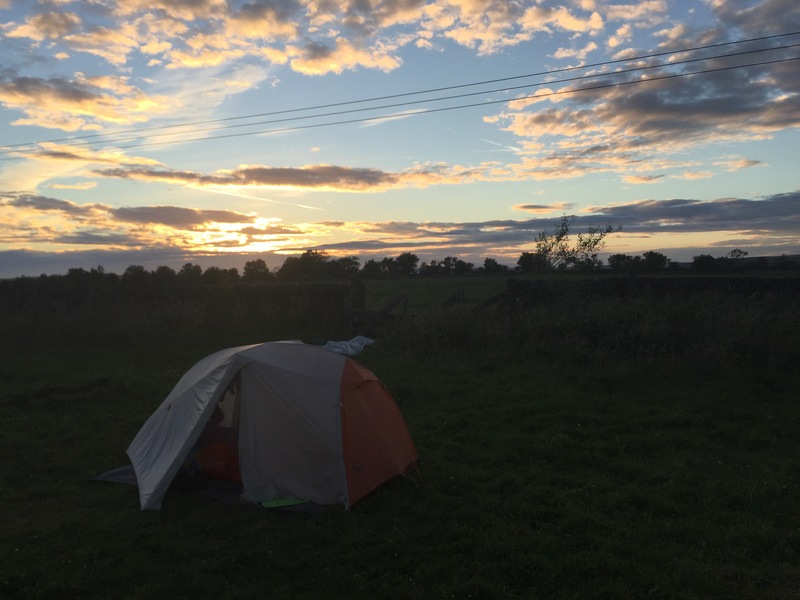 Finished up at Aaron’s campsite; a bit basic – no hot water or showers and quite windy but it’ll do me. The campsite was a few miles from Hebden Bridge and I had maps waiting for me but as it was a Sunday the Post Office would be closed. I decided to walk into HB to cover those few miles, spend the rest of the day in the town, get the bus back to the campsite and then get the bus straight to the PO first thing Monday morning – are you still following?! I bounced along with just a day bag and was glad to be unladen as the going was very steep, with complicated path networks and very squidgy bog on the top. As I crossed the moor an owl popped up which was a brief but exciting wildlife encounter. I descended into HB and it was buzzing. 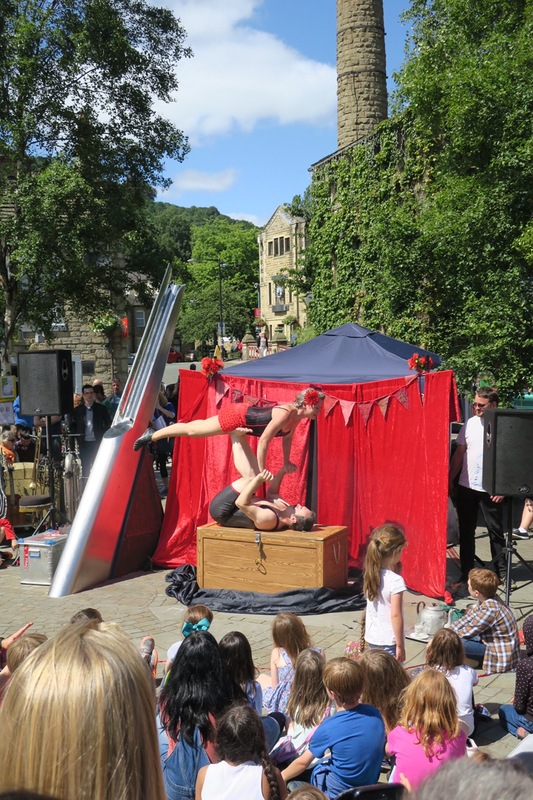 It turned out there was a street performance festival, a market and lots of things to see. The sun was shining and I soaked up the atmosphere and the rays. A perfect day topped off with a Sunday roast including an authentic Yorkshire pudding. Due to bus timetable alterations the first bus was at 10am – hence the late start. I headed due north alongside rivers and enjoyed the flowing water and dappled shade from the trees. 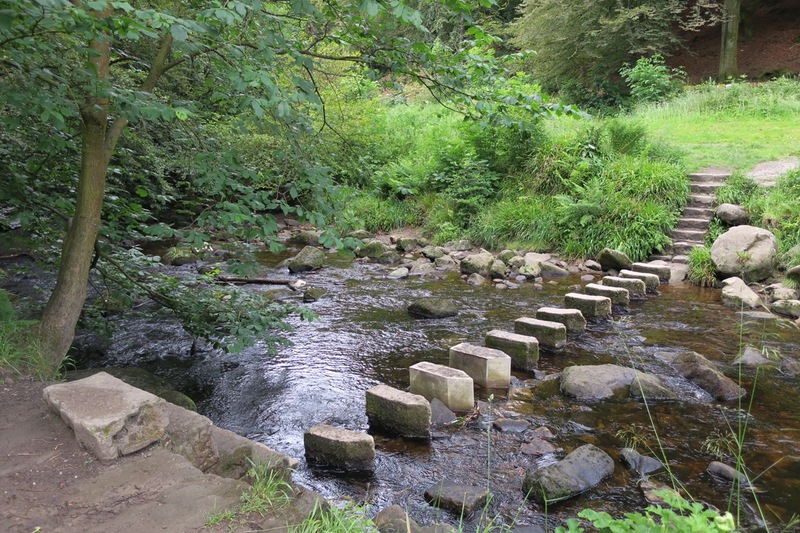 At a decision point the guidebook said ‘go left to take the road via the pub or continue up the riverside to take the direct route which joins up with the Pennine Way’. I opted to continue along the river – WRONG DECISION. The path rapidly became vague, the gorge got steeper and the terrain more precarious. I was scrambling over slippery moss covered rocks, between overgrown vegetation, ducking under low hanging trees, climbing over fallen trees and hating every step. I should have turned back but I got stuck in the mentality of; “I’ve come this far, I think I can see the end, I’ll just keep going”. I got scared, and moments from the book/film ‘127 hours’ were flashing through my mind. I could have easily slipped and fallen awkwardly and with it being so remote, no-one would come through here any time soon. After I fell and grazed my thumb I became angry at the guidebook for suggesting this route, I became angry at myself for persisting and I became angry at the time and energy I was losing. I eventually got to the end where the valley opened up and met a track. I sat on the tarmac and cried with relief. It was easily the worst hour of the trip so far and could’ve have been a lot worse. I’m not clear whether I had strayed from the path or not but either way it was a bit of a wake up call and a reminder to listen to alarm bells. If it doesn’t feel right, just turn back. 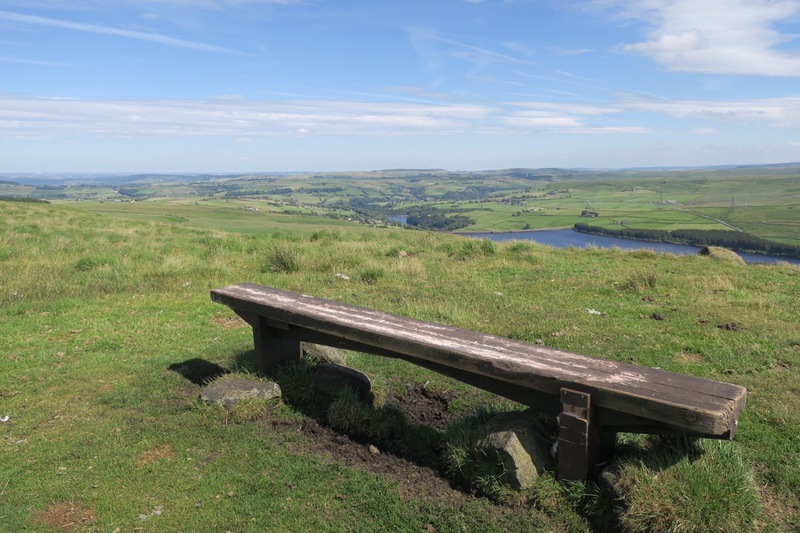 After I’d patched myself up and had something to eat I headed onto the Pennine Way (which I would now follow for the next 190 miles). Immediately there were walkers ahead and walkers behind and I felt reassured. I overtook 2 young-ish lads; Jasper and Max who I would see numerous times over the next few days and headed up over the moorland via Top Withins – the apparent inspiration for Heathcliff’s house in Wuthering Heights. I descended into Cowling late and exhausted. The campsite was very pleasant; basically someone’s back garden and the shower was delightfully hot. I ‘cooked’ some Super Noodles and flopped into bed. 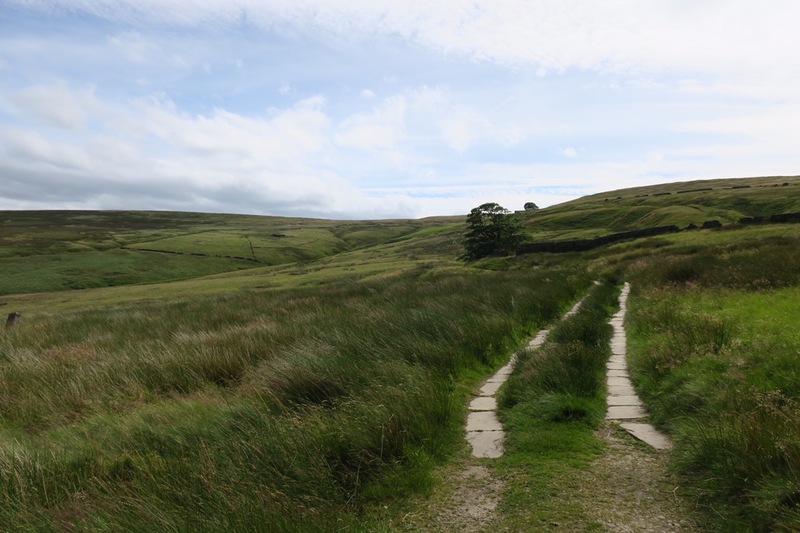 Not a vehicle track…it’s Pennine Way dual carriageway! Top Withins is on the horizon. Good to hear from you again, Lucy. It’s been a while but I am nevertheless amazed to read that you are well past the 500 mile mark and by now you will no doubt be approaching the 700 mark!! Hats off! You are doing brilliantly. I shall have to play your Proclaimers song twice in honour of your sheer grit and determination. I’m glad that you came through the scary bits and have been rewarded with staggeringly beautiful landscapes and the kindness of strangers. Yesterday I walked on the White Cliffs of Dover from Dover to Deal in my new walking boots and felt a bit sorry for myself when I acquired a blister a few miles from the end. What a wimp compared to you! Go Lucy!